Outside of some close friends, one of the little known secrets about me is that I used to salsa dance. Not only did I enjoy dancing, I also competed in group and couples competitions. Like all enthusiasts, I subscribed to all the salsa lists to learn about upcoming events, lessons with outside instructors and more. Since I broke my ankle preparing for a competition (um, long story =), I’ve discontinued following the salsa activities and unsubscribed from all the lists. At least I thought I did. Permission Marketing: Seth Godin’s book is key to engaging people via online marketing. Make sure you received permission from someone first. If you’re seeking to migrate your email list to Facebook, then be transparent about what you’re doing. Personally, the best thing is to ask those on your email lists if they would like to be contacted via Facebook – this way, they opt in for your Facebook communications. As such, make sure to allow for peopel to easily opt out of future communications. Provide trending reports, such as friend referrals, time of day opens, etc. And for members, we should be able to filter out communications beyond just the spam button. For example, I do want to stay updated with my friend, I just don’t want all the updates regarding the next salsa class or bachata dance off. What recommendations would you provide for marketers and to Facebook? Regardless of which camp you belong to, the discussion resulted in the creationing of a wiki to allow PR firms to proactively update their profiles. To the A few firms that did proactively update their profilesm thank you. To those who haven’t yet, why not? While 38 firms have corporate Twitter profiles, 5 firms deferred to individuals versus corporate Twitter. In total, 13 firms had individuals participating on Twitter. So, who else is missing from the list? Go to http://prfirmssocialmedia.pbwiki.com to make the udpates. There has been quite a bit of discussion from the original post and on a post by Jeremiah Owyang titled “Walking the Talk: Some Agencies and Vendors Demonstrate Social Media Prowess,”. I honestly didn’t think that my initial effort would generate such discussion, which I think provides a lot of fodder for thought. Client service comes first, always. Yes agencies should strive to have a presence of their own but not having a presence on Twitter or LinkedIn for their corporation is not a good measurement — at all. Agencies need to work hard to ease their clients’ or potential clients’ minds by showing hard metrics of how social programs have worked for other clients. There is also more justifiable pressure on marketers as a whole to demonstrate ROI from social media programs. Clients should start requiring these types of ROI metrics or case studies and not take “this is a new practice” as a valid excuse for the agencies not having proof points. The agency at the very least should be able to show how it’s built its own brand / the brand of its people through social media. I do agree with the position that a PR agency having a social media presence is not necessarily a barometer of how that agency can deliver results for clients using social media. However, I will argue that an agency’s ability to use these tactics/strategies to build awareness and industry expertise demonstrates understanding of the pressures that clients face and their objectives. This includes increasing incoming sales leads, communicating with key customers, building thought leadership, reaching key audiences, etc. Since I was laid off, I decided to do this research out of curiousity. I knew it would take time and spent a several hours over a two week period to “research” the original list. As I was doing this myself, I acknowledge that I may have missing or incorrect information. As such, I appreciate those who have provided updates in comments or emails to me. I have updated the table accordingly. And finally, as this endeavor is much bigger than I originally anticipated, I have set up a public wiki for agencies and the community to make updates directly. Would YOU Trust a PR Agency Not Involved in Social Media with YOUR Social Media Programs? A lot of PR firms are stating that they have social media capabilities and can help develop your strategy in this arena. So I thought, how many are actually practicing what they’re preaching? I decided to see which PR firms were actively participating in social media. [update 2/20/09] I initially evaluated PR firms listed on O’Dwyer’s list of top 100 independent PR firms. This list was based on worldwide fees for firms with major US operations. As such, some prominent firms, such as Ogilvy & Mather, Ketchum PR and others. Since this post was published, the list has been exanded to include firms that have proactively included information in the comments or email. It is now sorted alphabetically and includes different types of firms, such as IR, healthcare and technology. Almost all of the agencies did NOT link to their profiles on Facebook, LinkedIn, Twitter, etc. from their website. I would’ve expected this on their Contact Us page or linked from the Blog but this was very rare. While those who had blogs did a good job of putting the blog link front and center on the home page, some were too cute and hid the link under a different section of the website. If you’re one of these agencies and I found your blog regardless, it’s because it was listed on your site map. So let’s see how this little experiment works. If you’re a PR agency and I have incorrect information, please provide the corrections below or write a post that links back. I will then update the listing as quickly as I can. And if you have accounts with Flickr, YouTube and Slideshare.net, let me know. But If you don’t have a social media presence, tell me why. I want to give folks the benefit of doubt. I was able to format the list into a table below captured the list in a jpg (couldn’t get it to format correctly, sorry!) or you can download a pdf version of this list. visit the public wiki and make changes to the table. Update: 2/19/09 – This table was updated to be in alphabetical order, includes additional PR firms not on the original list, and eliminates “none” from the table. You can also visit the PR Firms Social Media Public Wiki to make changes. Levick Strategic Coms., Wash., D.C.
Update: I’ve edited this post to provide a more objective view of social media and how it can be applied. This is the third post in a 6 part series on how to use social media. In this third installment, I highlight how yoru can participate in social networking sites. Marketers are seeking to break into several social networking sites, such as Facebook, LinkedIn and MySpace. From my perspective, there seems to be two popular models right now – create a group or fan page or participate in existing communities (what Jeremiah Owyang calls “fishing where the fish are“). The former requires dedication to manage the community and ensure that there is fresh content. The latter requires participation in a group without the onus of owning that community. And while I believe social media should be an integral part of B2B marketing, the reality is that this takes a concerted effort and time. As such, I recommend aligning your efforts with the latter strategy until more staff or focus can be given to the former. While there are different communities to join, LinkedIn has some benefits that you should consider. Why? I hate to say this, but frankly, of all the social networking sites, organizations can be overtly salesy on LinkedIn. I know, I know – that isn’t the point. So let me be clear, I DON’T RECOMMEND THAT YOU SELL FROM THE PLATFORM. Rather, apply the same rules you would apply elsewhere – be transparent of who you are and offer valuable information. So even when others are being blatantly self-promotional, you and your company are seen as contributory. You’ll see what I mean below. LinkedIn Answers: Monitor questions for topics that are you related to your company. When appropriate, respond to relevant questions to position you and your company as an industry expert. There will be instances when you can recommend your company as a prospective vendor. Again, you have to be careful that you’re not too self-promotional as your answer can be flagged as inappropriate. Overall, LinkedIn Answers is a good way to provide brand awareness for your company. And since LinkedIn Answers are searchable, your responses may appear in Google search results. Groups: There are numerous groups within LinkedIn. It’s important to research specific groups as some may be more self-promotional than others. I recommend seeking groups with audiences that are relevant to your company and have good participation by its members. Once you join a group, monitor the discussions before fully participating. Group Questions: Like LinkedIn Answers, each group incorporates this same functionality. By responding or asking questions in a group, you position your company as an industry expert to a targeted audience relevant to your business. News: You can submit article links, like Facebook Share, that are relevant to the groups. In addition to blog posts, you can submit general news articles that mention your company or are relevant to your industry. You can also consider submitting submit press releases. While this is slightly self-promotional, make sure the article or press release discusses a larger trend of interest to the group. Events: LinkedIn recently introduced a way for members to post events. If you have a webinar, in-person seminar or other gathering that you want to promote, LinkedIn events is a place to promote it. What I liked is that they have an option for “virtual events” as well. You can then share this event with your contacts as well as be searchable by other LinkedIn members. One drawback, in case you have to cancel the event, there doesn’t seem to be a way to delete the event. Overall, LinkedIn is a great way to position your company or company spokesperson as an industry expert, while increasing brand awareness with key audiences. Your participation can also have competitive advantages as well when potential sales leads are researching and evaluating vendors. And if you or a colleague is dedicated to moderating an online community, consider setting up your own group. HubSpot has done an excellent job at setting up their own group, moderating the group and finding synergy with their Facebook presence as well. I have only been on a Facebook for a year or so. I mainly use it to keep in touch with personal connections, and rarely use it for professional reasons. I believe that the “casual” aspect of Facebook does make it more difficult for business-to-business companies to leverage the full potential, with early success for consumer related companies. Fan Club or Group? : Before setting up a group, you have the option of designating it as a group or fan club. Groups have membership limits while fans clubs don’t. It’s a small distinction but quite important depending on the size of the community you’re seeking to tap into. 1) Research what groups/clubs already exist in your area. Does it make sense to set up another page if there are hundreds of similar ones out there? 2) Participate in existing groups/clubs to network with people in your target audience. By “friending” these folks, you’re able to pull in your existing network if you do decide to launch your own group or fan club. Share and Share Alike: With Facebook’s “share” function, you can provide a steady stream of company updates and information to your friend network. For example, my company recently received media coverage in Forbes and San Jose Mercury News. I shared this news to my connections. In the end, you never know what information will catch a reporter/blogger’s eye for a possible article or posting. Friending Reporters and Bloggers: If a reporter or blogger has agreed to be friends with you, the implication is that you’ve created or have an existing personal relationship. Depending on your level of “friendship,” you can send pitches via Facebook’s internal email system, which may break through the noise of emails. Just confirm that the person prefers to receive pitches this way. He or she may want to keep Facebook on a personal level while want “business” correspondence to be received in another format. While I have not personally done this yet, I would just recommend being very careful of how and when you do this. As I wrote recently about HARO spam, the purpose of these tools is to create connections, not harvest emails and contact information. By doing so breaks the trust you’ve created. 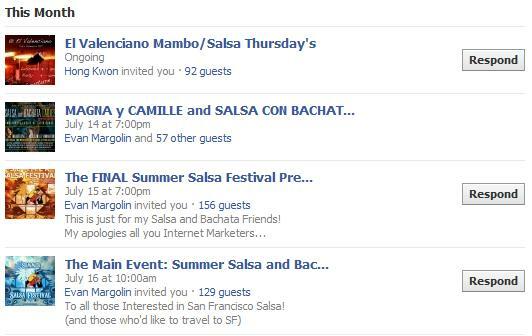 Promote Events: Facebook enables people to send out event invitations to your friends. Great way to promote attendance for live events or webinars. Be sure not to over promote an event with multiple reminders. Applications: As an open platform, Facebook offers different types of applications. These applications range from the silly – sending a beer – to useful – free VoIP phone calls or Twitter updates. For me, I’ve added the Twitter app to tie all my external personalities into Facebook. Determine which apps to incorporate based on the types of information your generating and which are appropriate for your company. Some have even created complimentary applications within Facebook which have become wildly popular. As long as it’s relevant to your Facebook audience, is easy to use and understand and is relevant to your business, apps can be one way to get your business to your target audience. Animation Mentor, an online animation school, is perfect for Facebook because it has tons of great content (video, events, pictures), a strong (current) student presence on the site, and our target customers (potential students) use the site regularly. For Animation Mentor, we set up a profile to connect with current students. From there, we added a Facebook page and rolled those students into fans. We then created a Prospective Animation Mentor Student group for individuals who were interested in the school to connect and share thoughts. Finally, we promoted the page off of Facebook using an Animation blog. Results: Facebook page ranks for targeted keywords on Google (e.g. #23 for “animation school”, #9 for “character animation”), we have over 700 fans with a mix of currents students and interested students interacting online, and we have an area for prospective students to address their concerns and interact directly with someone from the school in their space. We have also seen a near 3% conversion rate (i.e. complete an application) from the Facebook page. I posted my question on Twitter and LinkedIn. I decided not to ask my Facebook network as my previous questions have received no answers. I overwhelmingly received more responses via LinkedIn. Why? Twitter seems to elicit a lot of responses depending on the interest of your audience to that question and what other conversations are happening at the time. With the cacophony of voices, it’s very difficult, at least for me, to pose a question that elicits response. I did when I discussed the role of PR agencies but not for this question. For LinkedIn, people are leveraging it as a business networking tool. The Q&A section is a great way to demonstrate your expertise in a specific topic, as I outlined in my previous post. 3) Facebook is like a mini-site that has a social networking component. You need a wealth of relevant information to feed into the pages, while actively working to develop and maintain a community. Posted on April 16, 2008 by csalomonlee | Comments Off on Facebook Chat? Interesting. 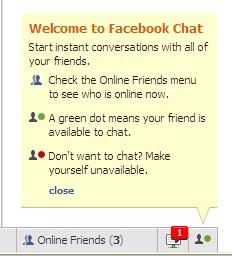 Facebook offering chat now. Do I really want another IM feature? Crap, I don’t even us Google Chat. Comments Off on Facebook Chat?